Here's one piercing rich in culture and style. Body jewellery for a helix piercing works well with any style imaginable, from classy and sophisticated right through to all-out rock statements. Pierced Helixes are popular the world over, though they carry symbolic meaning in many ethnic tribes in Africa, for example. Often used to signify beauty, wealth or good social standing, a pierced helix has even been understood to represent maturity. 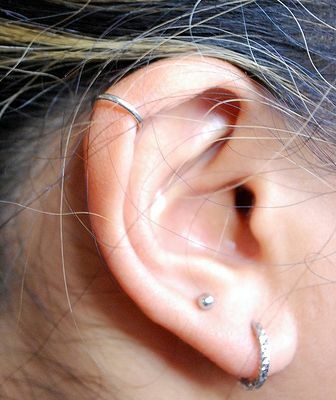 The helix is the area at the upper-outisde of the ear, where the cartilage is, though you can get your piercing done anywhere on the outside of the ear. Multiple piercings are also common. Relatively speaking, a piercing here shouldn't be too painful to get done, as there are few nerves in this part of the ear. That said, if you're considering a forward-helix piercing, proceed with caution. You need to find a talented professional to do this one for you. Under no circumstances should the piercing be done with a pistol or piercing gun such as which might be used for earlobes, as this can damage the cartilage, not to mention leaving a nasty bruise - a professional should always do your piercing with a special small gauge hollow needle. Once it has been done, though, it'll look amazing! In order for your piercing to fully heal, the necessary aftercare is required. Although it might be tempting, try not to touch the freshly pierced area for a while, and do your best to keep it clean. Just as with any fresh piercing, it's important to keep the area disinfected and generally keep the area clean. Hopefully you'll be able to change your original jewellery after around 2-3 months, though full healing of the wound can take up to a year. Owing to its rich cultural heritage and background in tradition, this is one piercing which knows no limits when it comes to style. Although it's rare to see any animal claws or teeth worn as body jewellery here, as they were originally in the tribes in Borneo, the possibilities available are just as wide ranging. With classy stars such as Jennifer Aniston and Cameron Diaz both boasting helix piercings, this is one body jewellery option which truly works for everybody. Whilst ball closure rings and straight barbells are some of the more commonly seen pieces of jewellery, there is an immense range of designs available. From traditionally feminine swarowski cristal jewels, right through to gothic fangs or subtle dream catchers, you can really choose a design to suit your mood. One major plus point is that this jewellery for helix piercings is incredibly comfortable, too. If you've multiple piercings you want to enhance, there is even a wide range of jewellery to bring out the beauty of any scaffold piercing.